L&T set to take complete control of Mindtree. A race that began in May last year, is finally coming to an end after a dramatic progression of events through the last 7 days. Promoters’ reluctance doesn’t work in the corporate world. It is all about the amount of money you can offer to keep shareholders happy. L&T’s attempt to buyout Mindtree is a classic example of this. Also, with this deal, a consolidation phase see s to be triggered in the mid-size IT space. First instance 10,733-crore rupees hostile takeover bid on Mindtree, engineering major Larsen and Toubro (L&T) on Tuesday said the deal got triggered after largest shareholder VG Siddhartha approached them three months ago, and exuded confidence in winning over the unhappy promoters. He said, it was a meeting of minds as the Cafe Coffee Day owner also believed in the values of L&T, he said. Subrahmanyan (MD and CEO of L&T) made it clear that L&T, which is looking at the Mindtree deal as an investment to deploy its cash of over Rs 15,000 crore, will want at least 26 percent stake in the target company. Subrahmanyan said the management of Mindtree had first approached L&T for a deal a few years ago, but the focus on succession planning and ongoing capital expenditure had prevented it from going further. He also made it clear that if not L&T, a substantial stake in Mindtree would have anyway been traded off to some other suitor as Siddhartha was decided on a selloff due to his business needs and requirements. Mindtree promoters have been trailblazing technocrats in creating a global enterprise with an impressive track record – there can be no two opinions about it. However, they have not been that smart businessmen in leaving such a gaping hole for a hostile takeover ; bound to happen sooner than later. While one can empathize with the promoters considering the intertwined emotions in building an organization from scratch in the new economy domain so dependent on human resources, they need to look at the stark realities of the biz terrain ; and welcome a professional organization like L&T in the inevitable development rather than an unknown entity with an eye only on he Return on Investment. On Monday night announced that it reached an agreement to acquire VG Siddhartha’s 20.32 percent stake at Rs 980 a share (valuing his stake in Mindtree at Rs 3,269 crore) and also announced its intention to raise the ownership to 67 percent by buying an additional 31 percent through an open offer (at the same price of Rs 980 a share which is 1.81 percent premium over Monday’s closing price) and another 15 percent off the market. Adding further Subrahmanyan said while L&T Infotech is betting big on areas like banking, insurance, manufacturing, oil and gas, and insurance, Mindtree is big on retail, consumer packaged goods, hospitality, travel and technology segments which will create lots of opportunities and synergies. Group CFO R Shankar Raman said it will take 30-45 days for getting requisite clearances from the Competition Commission and anti-trust watchdogs in certain markets that LTI and Mindtree operate in. The attempted hostile takeover bid of Mindtree by Larsen & Toubro is a “grave threat” and “value destructive” to the organisation collectively built over 20 years, the promoters said pledging to “unconditionally oppose” the hostile takeover attempt. 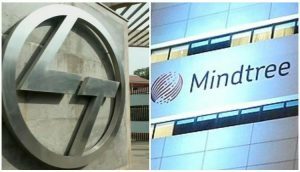 Meanwhile, Mindtree said it had in 2018 found certain irregularities in disclosures relating to pledge made by Coffee Day promoter V G Siddhartha. In this regard, a complaint has also been raised against Siddhartha alleging insider trading during his stint at Mindtree has also been filed with Sebi by an anonymous person, according to sources. Indian IT services industry( which I discovered is very rare, not only in India but elsewhere across the globe in IT services industry). But going the immediate fall in share prices of L&T after their decision, I guess even their shareholders aren’t exactly happy over what is unfolding in front of them. Crazy days ahead for both the companies as neither of their promoters will give in easily, opening up the possibility of a compelling and messy fight ahead!!!! Will L&T allow promoters of Mindtree to enjoy management control with just 13 % shareholding is the issue. This is an ironic question for L&T management as in the past it has talked about maintaining professional management control and even thwarted takeover bids using this issue. It is not too difficult to convince L&T that the management control of Mindtree should not change with change in holding. Unfortunately, posturing by Mindtree has veered the conversation on intangibles while seeking a tangible control. SBI: What Lies Beneath the Truth? Will It Become Bigger and Better in Future?